이 제품은 단종되었습니다. 대체품으로 UWPH-2A-NEMA-M12 를 확인 요청드립니다. 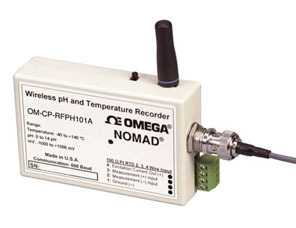 The OM-CP-RFPH101A is a miniature, wireless, battery powered, stand-alone, pH and temperature transmitter. This all-in-one compact, portable, easy to use device will measure and transmit pH and temperature measurements. When enabled, the wireless transmitter will transmit readings back to the host computer where the data can be analyzed in real time. These readings are also logged to the device’s memory for added data security. The convenient slide switch allows the transmitter to be turned On or Off without affecting the operation of the device. The OM-CP-RFPH101A is a major leap forward in both size and performance. Numerous devices may transmit data to the same receiving station. The Windows software converts your PC into a real time strip chart recorder. Data can be printed in graphical or tabular format and can also be exported to a text or Microsoft Excel file. 참고: Operator's manual, battery, RS-232 cable, and receiving antenna are included with the OM-CP-RFC101A Windows software (software is required to operate the data logger and is sold separately). (NIST calibration for temperature only).